Red-eye and dry eye syndrome are quite easily confused. Both conditions include itchy, red and dry-feeling eyes. A person who has dry eye syndrome will often think that their red, dry, itchy eyes are nothing more than something minor, like allergies, and live a long time with the severe comfort that comes with dry eye syndrome. He/she will find that, regardless of what measures are taken, the condition does not change significantly and an eye doctor must be consulted to bring relief. Fortunately, Dr. Anthony Mondo is very familiar with the symptoms of dry eye syndrome and how to treat it. The leading defense against either of these forms of dry eye syndrome is a type of specialty eye drops called “artificial tears.” These special eye drops to combat the uncomfortable symptoms of dry eye syndrome by imitating real tears as closely as possible. In order to do this in the best way possible, there are many different formulations of artificial tears. Each formulation addresses a different underlying cause of your dry eye. 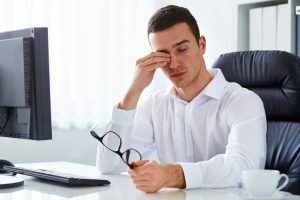 Some help to address the issues of dry eye syndrome in which tears are lacking in quantity and others will add one or more building blocks to your tears to help them better perform their intended function. Many times, red eyes will heal up and return to normal without any medical attention at all. A not of caution, however: The great number of conditions that can cause dry eyes makes it very hard to know exactly what the cause may be sometimes. If your red eyes are accompanied by a high fever, headache and/or a great deal of eye pain, go to the doctor immediately. This note aside, red eyes are almost always minor and should not cause anxiety unless accompanied by these additional symptoms. Even with a brief but comprehensive explanation such as this, it can sometimes be hard to tell the difference between these two similar-looking conditions. If you feel your red eyes may be something more, come see Dr. Mondo today.